With a view to setting new standards for hotel rooms of the future, the SHTM collaborated with its teaching and research hotel, Hotel ICON, to again organise a global competition in 2014 to shape guestrooms of tomorrow. Taking the theme 'The Hotel Room of the Future', the competition this year will be held from September to December 2014. Professionals in interior or hotel design, and design students from tertiary education institutions are invited to submit their design proposals individually or as a team for one of the Tomorrow's Guestrooms to showcase their vision of hotel room design for guests of the future. Entries in the competition will be reviewed by an expert panel, and winners may have the chance to have their design realised in one of the dedicated research bedrooms at Hong Kong's one-of-a-kind teaching and research hotel - Hotel ICON. My first international adventure was an amazing one. 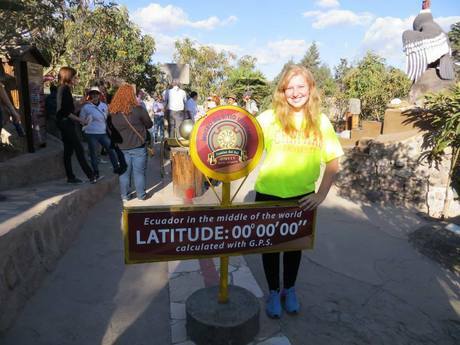 Elaine Keane is an occupational therapist that has opened, Crecer, a free clinic in Ecuador. Six occupational therapy students, six physical therapy students, and our professors ventured to Ecuador to provide services at Elaine's free clinic along with other sites in the area, including an adult day care, nursing home, and orphanage. Throughout the week, the OT and PT students took over the caseload at Crecer Centro de Rehabilitación, Educación, Capacitación, Estudios y Recursos, Inc. My group, composed of two OT and two PT students, saw clients pediatric to adult. One of our successful cotreat sessions was with a young boy with spastic cerebral palsy. The PT student held the boy on his knee focusing on breaking up his tone with proper positioning while I completed a tabletop activity with the boy encouraging him to bring his hands to midline while completing fine motor tasks. Our class also worked with an adult who suffered a TBI after a fall at his electrical job. One group worked on his mathematical skills by creating a mock store and asking him to purchase items and calculate the correct change. Another group arranged the therapy room to mimic his electrician job site. The client demonstrated what his job entails as the OT and PT students noted areas that needed improvement before he is able to return to his job. At FUNHI, the adult day care, we had a sports day playing adapted versions of volleyball, soccer, hockey, and ring toss. We also celebrated a Quinceanera with the clients. We took this opportunity to create birthday cards with those who hoped to improve their fine motor skills. Those who needed to improve range of motion helped us decorate the room with crepe paper and balloons. The Asilo orphanage and nursing home were less focused on individual therapy sessions and more so aimed at serving the large population in a volunteer aspect. The girls at the orphanage ranged from 18 months to 14 years old. From painting nails to making balloon animals, the girls had a blast and the students didn't want to leave. At the nursing home we first helped shower the residents each morning. It was a very humbling experience. In the afternoon we had a fiesta with the residents, which included balloon games, jewelry making, and a lot of dancing. The trip wasn't all about work. We had plenty of fun- zip lining upside down in the Andes Mountains, white water rafting in intertubes, relaxing in the hot springs heated by volcanoes, learning how chocolate is made, going to a butterfly house, orchid tour, tasting guinea pig, and sightseeing. I thoroughly enjoyed my first traveling experience and can't wait for traveling opportunities in the future.